Repositions Human Meshes Including Internal Structures. VariPose is a specialized capability in XF that repositions the voxels of the Male Visible Human mesh including internal anatomical structures. The body can be posed in realistic positions depending on the specific user application. The repositioned meshes are important in various bio-electromagnetic calculations including MRI, automotive, and body-worn communication devices including cell phones, wireless laptop, and blue tooth devices. Starting with the Male Visible Human in 10, 5, 3, 2 or 1 mm voxel format, VariPose allows the user to reposition body joints from knee, hip and elbow down to thumb and finger joints. 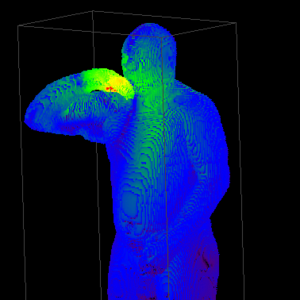 The actual repositioning process is computationally intensive and may take hours to days depending on the mesh voxel size and number of joints being repositioned. To make this efficient for the user, VariPose consists of two modules: the Graphical User Interface and the Biological Mesh Repositioning Engine. The GUI allows viewing of the original mesh and any subsequently repositioned mesh, and provides information on the meshes including number of voxels of each tissue type, change in mass by tissue type after repositioning, and both 3D and 2D visualization. The GUI also has a stick man skeleton which the user can manipulate in real time to control the repositioning of each joint. Once the user is satisfied with the new mesh position, the GUI writes a control file that is then read by the Repositioning Engine along with the original mesh. Once the Engine has repositioned the biological mesh, it can then be read into the GUI for evaluation. VariPose will provide repositioned meshes in both XF and generic voxel formats. VariPose comes bundled in the Bio-Pro version of XF. See the XF Versions Comparison Chart for more information, or contact sales for pricing information.